Washington, DC—The Institute of Museum and Library Services today announced 30 finalists for the National Medal for Museum and Library Service. 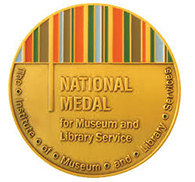 The National Medal is the nation’s highest honor given to museums and libraries for service to the community. For 21 years, the award has celebrated institutions that demonstrate extraordinary and innovative approaches to public service to make a difference for individuals, families, and communities. To learn more about the 2015 National Medal finalists, visit www.imls.gov/medals.